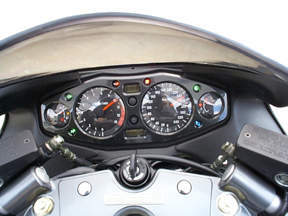 Speeddemons.com - 1999 Suzuki Hayabusa 175 rear wheel HP!!!! 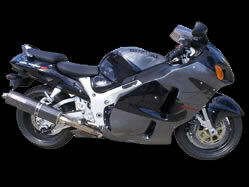 1999 Suzuki Hayabusa 175 rear wheel HP!!!! "Ultimate Sport" machine that sets new standards for high-performance motorcycles. The King Of Speed And Faster !!! Cams. Yoshimura pipe. Metzeler racing tires. New (Dec 9, 1999) ** Our bike, with its modifications, was dyno'd today at 175 horse power at the rear wheel, 190 at the crank, and she still purrs like a lion!! 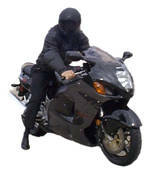 Click the movie to the right to see a stock Hayabusa reach 200.2 mph! 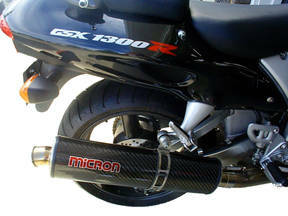 Stainless steel Micron 4 into 1 oval carbon fiber canister exhaust system reduces the bike's weight, and adds an additional 8 hp! Aerodynamic fairing design with low drag coefficient. All fairing components have been designed for reduced drag and turbulence. 16-valves, Twin Swirl combustion chambers, plus gear-driven counterbalancer for smooth operation.Electronic fuel injection system, fed by 46mm throttle bodies and ram air intake with large volume airbox. System uses single injector per cylinder with fine spray pattern for good throttle response and fuel efficiency. Light-weight shim-under-bucket valve train with narrow 14 degree valve angle for high combustion chamber efficiency. High efficiency liquid-cooling system for optimum engine operating temperature-including compact air-cooled oil cooler, plus oil-jet piston cooling. SCEM (Suzuki Composite Electro-chemical Material) plated cylinders minimize cylinder size and improve heat dissipation. 6-speed transmission with high-capacity clutch featuring back-torque limiter system for smooth downshifts and scissors-type primary gear for reduced gear noise. Large volume 4 into 2 exhaust system with stainless steel head pipes and lightweight aluminum silencers. Digital direct-ignition system combines an ignition coil with each spark plug cap for reduced weight and stronger spark. Full instrumentation with ultra-thin step-motor construction. Includes fuel gauge, clock, LCD odometer and twin tripmeters with fuel consumption gauge. Unique, vertically mounted dual headlight provides a bright, wide beam with a 60W projector-type high-beam and a 55W low-beam halogen bulb. Rigid twin-spar aluminum frame minimizes weight while maintaining high torsional strength. Large diameter (43mm) inverted front forks with fully adjustable compression & rebound damping and spring preload, plus steering damper. Proven link-type rear suspension with remote reservoir shock absorber. Rear suspension features fully adjustable rebound damping and compression damping and spring preload. 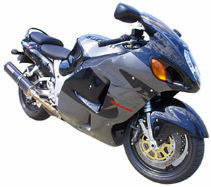 Bridged-type swingarm with large diameter swingarm pivot shaft provides high swingarm rigidity. Powerful front disc brakes with large 320mm discs and 6-piston calipers. Rear disc brake with 240mm disc and 2-piston caliper. Radial tires mounted on lightweight 3-spoke aluminum wheels. Wide 190-size rear tire is mounted on 6" wide rim. Hinged fuel tank simplifies maintenance and provides easy access to the airbox and air filter.